"Tangent (tan' jent): to break off suddenly from a line or train of thought and pursue another course." The year was 1997. DC Comics was looking to fill out their schedule for the last week of December. It's tradition to print a series of connected one-shot issues on the fifth Wednesday of the month so to fill that gap, DC turned to the man who killed the Man of Steel, Dan Jurgens. Jurgens came up with the idea of exploring a brand-new Alternate Universe with some familiar names where the presence of superheroes had had a much bigger impact on history than the standard DCU. This wouldn't be an Elseworld, though: The names would be the same, but the faces, powers, and backstories radically different. The Flash was now a teenage superstar with light powers, for instance, while Green Lantern was a mysterious woman who dealt with ghosts. To hammer home just how different this world was, DC dropped their logo from the covers and created a whole new imprint just for the occasion: Tangent Comics. The Tangent Universe is a world not too different from our own, at least up until the 1960s. The Backstory goes that in 1962, the world's first super-hero, the nuclear-powered Atom, burst onto the scene, sending America into a super-frenzy and heralding the arrival of other costumed crimefighters. The Atom used his powers to help push the world's science ahead a few years, and by the present, technology is about ten years ahead of ours. The Tangent Universe is no utopia, though. Around the same time the Atom first appeared, the Cuban Missile Crisis went down... and someone pushed the red button. In a split second, the Cold War turned hot as nuclear warheads streaked back and forth across the Gulf of Mexico, wiping Cuba and Florida off the map. World War III raged for seven years. But America scored an early victory in The Vietnam War, and finally brought the war to an end in Czechoslovakia in 1969, but not until the Russians' deadly Red Tornado bio-weapon killed millions, including the American hero Captain Comet. In the end, both super-powers settle back into another uneasy Cold War, but the possibility that war could erupt again remains very real. The Atom: Grandson of the retired original Atom and son of the murdered second, Adam Thompson struggles with his newfound fame, but quickly learns a dark secret hidden in his family tree. Metal Men: A squadron of unpowered army men prove to be the real heroes of World War III. Flash-forward 30 years, when one of them is the President of the United States and another plots against him as the director of Nightwing. The Flash: A teenage super-celebrity with sparkling powers and personality unwittingly foils the plots of her father, a nefarious but comically inept Nightwing agent. Green Lantern: A beautiful masked woman wanders the world's graveyards at night, conjuring up the souls of the deceased with her magic lantern to give them one last shot at finishing their unfinished business. Sea Devils: Deep beneath the radioactive waters of the Devil's Archipelago (once the state of Florida), a race of mutant Fish People struggle against the callous surface-dwellers. Only a group of young rebels can bring together the two peoples. The Joker: An acrobatic anarchist with a wacky sense of humor humiliates cops and robbers alike, but there's more to her than meets the eye. Secret Six: Flash, Atom, and Joker covertly team up with newcomers Manhunter, Plastic Man, and Spectre to take on Nightwing and the evil Aquaman. Doom Patrol: A group of time-travelers come arrive from 2030 warning of the impending apocalypse... but could they be the disaster they're trying to stop? Nightwing: The shadowy agency gets a wake-up call when several of their own go rogue, but who's really pulling the strings? Powergirl: A living weapon created by the Chinese government whom the surviving Metal Men will do anything to obtain for the U.S... if Nightwing doesn't beat them to it. Wonder Woman: An alien warrior-philosopher arrives on Earth fleeing her creators, wondering about the meaning of her existence. The Superman: An average cop has a near-death experience that triggers something inside of him, giving him vast telepathic powers at the expense of his humanity. The Batman: A genuine Dark Knight and traitor to the Round Table of Camelot, cursed by Merlin himself to fight evil as an empty suit of armor until he atones for his sins. JLA: A covert ops group with technology-based powers working for the U.S. government tries to eliminate the world's superhumans. ...and that's where the story ends. It's probable that Dan Jurgens had plans to conclude the storyline with the defeat of the Ultra-Humanite, but it never happened. Tangent Comics was never revisited and the whole world was left hanging. Flash forward. 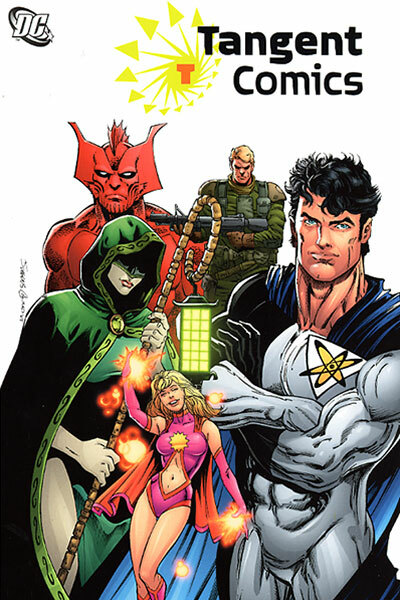 In 2005, the Tangent Universe was established as part of DC's wider multiverse in a cameo in the Crisis Crossover Infinite Crisis in 2005, but lay fallow afterwards. But finally, in December 2007, the tenth anniversary of our first foray into the Tangent Universe, our Justice League of America stumbles across a paper lantern with strange mystic properties that opens a portal to a whole new world -- nay, universe -- of adventure. Anthology Comic: Both Green Lantern one-shots told three short stories with the Lantern herself as the narrator. The Atoner: Batman. Also Manhunter, according to one of the possible back stories of the Green Lantern. Badass Normal: The Joker. The JLA are an evil version of the trope. Bat Signal: More like "Joker Signal." Heh. Beware the Superman: Literally. Most of the other superheroes are struggling against him, though. By the Power of Greyskull: Wildcat, one of the Nightwing rogues, can turn into a monstrous werecat by saying (or hearing) the word "Shazam". The Cape (trope): The new Atom. Superman started out this way before he lost touch with his humanity. Chest Insignia: Flash and Atom. City of Adventure: New Atlantis. Comic Book Time: Averted. 10 years passed both real-time and in-universe before Superman's Reign. Continuity Cameo: The Titans from Adam Warren's Elseworlds one-shot Scissors, Paper, Stone appear in costume as members of a protest group in The Joker. Continuity Overlap: This pretty much defined the original two waves of one-shots. Disability Superpower: Plastic Man was put in a coma by an explosion but gained the ability to project his mind into a malleable plastic body. Five-Man Band: The Sea Devils, though there are a few spares to be had. And the Secret Six, where, again, you have a little overlap. Freak Lab Accident: Plastic Man and Aquaman. Gone Horribly Wrong: The Doom Patrol go back in time to try and warn humanity of what will happen to Earth in the future, while at the same time trying to prevent certain events that led to Earth's destruction. They wind up instigating said events instead. I Love Nuclear Power: The Atoms, Flash, Superman, and the Doom Patrol's Firehawk all gained their powers directly or indirectly from radiation, though the original Atom had been twisted and shriveled by the experience. In Name Only: Not as a bad thing; it's kinda the point. Jumped At the Call: The Flash, like, totally loves being a superhero, for sure! Knight Templar: Superman. Sure, he's enslaved billions, but it's for the greater good, don't you understand? Lamarck Was Right: The Atom and Firehawk of the Doom Patrol gained their powers from their parents. Lampshade Hanging: The crossover had lots of fun with the various name-similarities, including DC-Batman being taken aback to learn that Tangent-Superman's real name was Harvey Dent. Multiple Choice Past: Green Lantern tells three separate, contradictory versions of her origin, implying that one, some, all, or none of them may be true. Making a Splash: Aquaman is a living ocean! My Greatest Failure: It eventually surfaces that the original Atom inadvertently caused the nuclear war that destroyed Florida and Cuba and spent the rest of his life running away from the fact. One-Hit Wonder: The Sea Devils one-shot counts as this. The particular band of Devils it focused on don't appear anywhere else in the Tangent universe following their one-shot. Our Werebeasts Are Different: Wildcat is a teenage girl who transforms into a feral werecat when her handler says the word "Shazam". Personality Powers: It's only natural that someone as bubbly as the Flash should have light-based powers, don't you think? Phony Psychic: The Doom Patrol try to pass off Star Sapphire as a psychic instead of revealing they're from the future. President Sam Schwartz is named after legendary DC editor Julius Schwartz. Superman's identity as a telepath who goes mad with power hearkens back to the original, rejected pitch for Superman in the '30s. Set Right What Once Was Wrong: Green Lantern has the power to bring one person back from the dead each night to settle unfinished business. But the dead person won't go back until issues have been properly solved. Stable Time Loop: The Doom Patrol tries to save their future, but inadvertently cause the catastrophe that will destroy the world. Sunglasses at Night: Hex is never seen without his shades; he clearly thinks of them as part of his larger "image". Twenty Minutes Into the Future. Secret Identity: Few if any characters have one. Steven Ulysses Perhero: Arthur Thompson becomes the first Atom and was followed by his grandson Adam. Villain Team-Up: The Fatal Five, who killed the second Atom. Well-Intentioned Extremist: Superman just wants to make his world a better place, and decided that being a totalitarian dictator was the most effective way to do it. What Happened to the Mouse? : No explanation is given to what happened to Christie Xanadu ( the third Joker), Wonder Woman, or the Sea Devils, in Tangent: Superman's Reign. This page was last edited on 11 April 2017, at 08:49.